I am getting behind on my blog. Apology, please accept. Here's a short post to hold you over since I know you are just drooling with anticipation for my every written word. My precious Granny Nora is sick. Bladder infection. My guess is it's a classic case of too much Coca-Cola. Please pray for her. 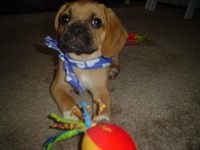 Brokaw the wonder puggle is amazing. He's growing before my eyes... he gained a pound and a half this week! He's now up to 7.5lbs. Oh, the life. Katy is adjusting. I have more funny puppy stories to share but because of the funny puppy stories, I have no energy to do so. Also this week, I thought the Goodbye Charlie fest on GMA was really sweet and not too over the top, just like Charlie himself. Great guy. Great name. How could you not love him? 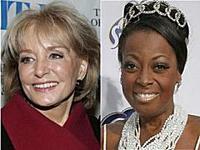 Star Jones vs. Barbara Walters. Ha! I am loving watching the fallout over this story. LKL was great tonight. Star with her fake smile, I just want to bust through the TV and tell her off. Such a diva. I am so NOT a fan. I am sure she is destined to have her own weak daytime TV show that will fail after its first season. I am SO suspicious about her weight loss. GBS people, I think so. I am just loving all of the headlines and supers: "Star Wars", "Star Crossed", "Fallen Star," "Shooting Star." Thanks for having a name like that. It's a television producer's dream. Oh... the wordplay possibilities. One more thing. I bought "Failure to Launch" this week. It was OK. Anything with my precious Matthew in it is fine by me, and I'm glad I own it for just that reason, but it's not as great as "How to Lose a Guy in 10 Days." This weekend I am traveling to Virginia for Granny's birthday bash. Please pray for Granny. Please pray I don't give up in the holiday weekend traffic and turn around. And please pray that my mother and her sister don't get all Jerry Springer and kill each other at the party. Cheers! Have a happy 4th!